The news is out: water levels in Mumbai are over 15 per cent less than last year. It might seem routine but it has the city up in arms. Mumbaikars have hit the roads demonstrating on the painful summer that came in early this year. The Brihanmumbai Municipal Corporation (bmc) started the summer with a ten per cent cut in water supply, from that of last year, and hoped that the rain gods would bail it out. But now, many liquid facts are gaining shape. It is pretty obvious that life isn't fair for most in Mumbai. But, while ordinary Mumbaikars, as also the rest of Maharashtra, reel under a grave water scarcity -- and subsequent cuts in water supply threaten to only get worse -- there are many who might not be aware of one grim reality. 24 water parks in and around the city in Thane and Raigad districts use over 50,000 million litres of water everyday. Esselworld's Water Kingdom itself , spread over 24 acres of land within Mumbai, receives over 7000 million litres of water a day. "This is twice the supply provided to the whole of Mumbai," says Susheila Cardozo, director, Stree Shakti Sadan, an organisation that works with fishing community women. "We don't have water to drink but others are dancing in it," she says. The worst affected are the north-western suburbs of Mumbai. These areas have seen enormous influx of residents and several residential complexes, with high-rise buildings, have come up in a short period. These suburbs have several large hotels, clubs and some water parks. 84 bungalows have also come up in this part of the city. Many of them have luxurious swimming pools which are let out regularly for film shootings. "Swimming pools and water parks use large volumes of water while the locals yearn for even drinking water," says Vidya Chavan, president, Mumbai Janata Dal. In the entire stretch of villages from Versova to Madh and Gitanagar in Colaba, the original residents don't have water. 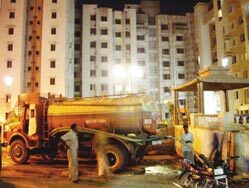 For years they had virtually no municipal supply even though they fall within bmc's jurisdiction. Local social organisations like the the Stree Shakti Sadan and the Dariya Mata Macchimar Mahila Sanghatana protested and demonstrated. Then with the help of the local member of Parliament, Ram Naik, a pipeline came into their lives. Villages started to receive water, though at an unearthly time -- between 2 a.m and a.m. "Even this has been dwindling since the past few months. Earlier the bmc sent one tanker in two days but now there isn't one in even eight days in Madh and surrounding villages," says Krishna Koli, president of Harbadevi Macchimar Sahakar Saunstha, another organisation that works among the fisher folk of Madh. The locals accuse the authorities of deceit and daylight robbery. They say that local village water is used to supply urban guzzlers. And, then the bmc makes it appear a big favour when it doles out meagre water supplies to the same villages. An example: The Madh village church premises was used to construct a big underground tank. In lieu there were promises of water for the village. But there is no water as it goes to the rich outside the village, says Cardozo. "The bmc claims to have spent Rs 47 lakh for providing water to the Gorai village but we don't seem to see any water," she says. "Large quantities of the groundwater are getting depleted as tankers stock up from wells and tanks. The local agricultural communities have little for their fields. Perennial water wells now have sea water creeping in because of depletion of sweet water," explains Cardozo. With paucity, water has become the best currency. Further up the western track, in Borivali, local politicians are making money through illegal connections. The bmc engineers in this region have demolished these connections a few times. But they have always come back. The fishing community in Malad and slum dwellers pay Rs 2 for 30 litres of water while residential buildings pay Rs 3.50 for 1000 litres . In Malad, a cartel of slumlords sells drinking water and also supplies this scarce commodity to hotels and other institutions. Water is accessed and used by several citizens through 'leakages' in the supply and distribution pipelines. Chavan alleges that local bmc workers are completely corrupt and are hand in glove in letting the water cartels operate. "Short supply in the city doesn't apply to everyone", says Debi Goenka of the Bombay Environment Action Group. Now Mumbaikars are up in arms. Several organisations are asking the bmc to let them know from where the additional water required for the influx of multi-storeyed buildings will come from. "There is a marked change in the distribution of the city's population with the north-western suburbs witnessing mushroom growth while the southern part of the city sees a decline". However the distribution of water continues following the older pattern, alleges Nicky Cardozo, a social activist. The government and the bmc however maintain that there is no shortage in the city. They say that the demonstrations and demands are from pockets with localised problems. And those are being looked into by the bmc. For one, claims the government, Mumbai is supplied water at the rate of 265 litres, per person, per day. Even after the estimated loss of 25 per cent it is far higher than the national standard of 150 litres, per person, per day. Sudhir Thakre, director, water supply and sanitation department in the Government of Maharashtra says that water distribution in Mumbai is equitable. All areas are supplied water evenly for about two to four hours a day. He explains that if a building has a 24-hour supply it is because it has tanks to hold water. Says a state government officer, "Citizens should look at themselves also for solutions instead of blaming the government for everything." For instance rain harvesting is an option that is commonly used today in rural areas in Maharashtra but not in Mumbai. "Why have buyers not insisted on rain water harvesting systems when buying flats?" asks this officer. Anand Deodhar, hydraulic engineer, bmc , presents the municipal commission's side of the story. He says that the monsoon has been sparser in the last three years, so there aren't sufficient reserves. According to him a municipality can cope with the normal anticipated population growth. But the huge migrant population that streams into the city everyday cannot be reckoned for. "So water supply gets affected in areas where the slums and bastis are in large numbers," explains Deodhar. He feels that theft, leakage, pilferage is difficult to monitor given the expanse of the city and the small, scattered nature of the activity. Changing the pipeline network is a slow job. 30 per cent of the 3000 kilometres (km) network requires repair or replacement. With road levels being raised it means digging seven to eight feet -- earlier it was only four feet -- to reach the pipes. Only about 150 km has been replaced. Odd times for water supply are also taken care of, according to Deodhar. "We take care that areas like the chawls with limited storage get water at suitable hours while buildings with storage facilities are supplied at other times. So why is water provided at an unearthly hour to the fishing villages? He says this is an oversight that can be looked into by the bmc. Deodhar also contends that just 13-14 per cent of people in Mumbai get a slightly lesser flow while under two per cent need to walk a short distance for their water. "If Mumbai really had such a severe problem why would people keep flowing in?" he asks. Lack of knowledge among users leads to considerable wastage of water. But the state government has done precious little to tackle this chronic problem. There has been little efforts at educating people to reduce water wastage. Much water flows down drains as a result of people leaving taps open, dripping, or washing half loads in washing machines. At present flushes consume 40 litres of water per person, per day, on an average. Cutting down on this can save between one-third to two-thirds of the total water used. Since 2001, new buildings are supposed to have rainwater-harvesting system and the bore well water system is to be used for flushing in domestic toilets. There is little evidence that this rule is being adhered to. It will be implemented only when the government or the corporation monitors it seriously. And for that to happen, residents of Mumbai must keep the authorities on their toes. The people are determined this time to take the issue by the throat. Chavan and Susheila Cardozo say that they will demand that excess supply by tankers be limited during shortage periods. They should also demand that large consumers bear responsibility of returning water to the land rather than draining it into the sea. The activists were shown a treatment plant by a big water park. But its capacity wasn't even a fourth of the park's consumption, says Cardozo. Its raining in Mumbai now. But water caught fire in the city this summer. And protesters are sure that they won't let it simmer down. Unless immediate measures are undertaken to address the grave disparity in water distribution in Mumbai, the city is likely to witness many more summers of protest.